The new Fabarm L4S series includes three 12 gauge autoloaders with 26 or 28 inch barrels. This is what Fabarm has to say. 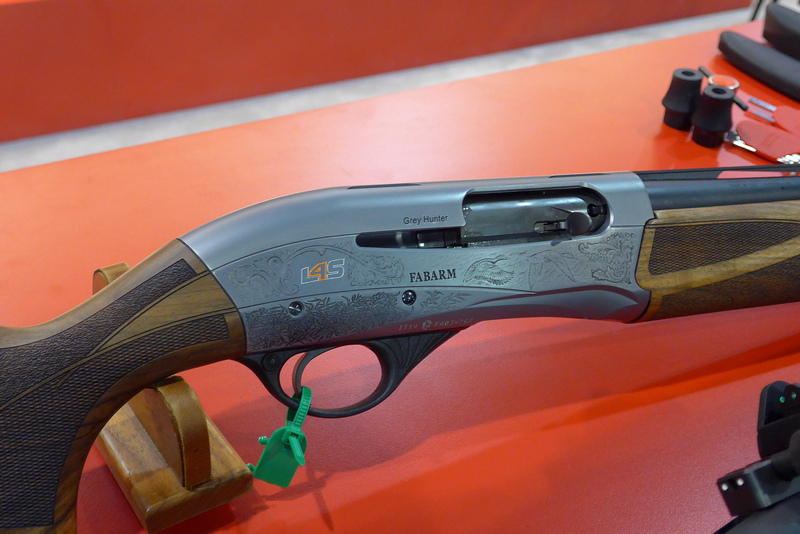 FABARM USA is introducing an innovative new line of semiautomatic shotguns designed for bird hunting. The new L4S family of shotguns exhibits the same high level of precision and finish that FABARM is famous for in a product that is competitively priced for the North American market. The L4S incorporates an innovative new design that allows the fore-end to be removed without disassembling the shotgun. The design has two significant advantages. Removing the fore-end allows the action to be cleaned and lubricated without having to disassemble the whole gun. Additionally, it eliminates having the wood be part of the structural assembly of the gun, making the action and barrel relationship more accurate and stronger. By taking the stress off of the wood fore-end you also eliminate the forces that can damage and crack the wood. All grades will feature Turkish walnut with a satin oil finish. The L4S is lightweight making it a pleasure to carry in the field and has a gas operating system that significantly reduces recoil. It will handle every type of ammunition from light 2 ¾” target to heavy 3″ magnum hunting loads. Other notable features include a stock shim system for adjusting fit and TRIBORE HP™ tapered barrels for the ultimate in ballistic performance. The initial offering is available in three attractive grades: Initial Hunter (black action), Grey Hunter (silver action with game scene), and Deluxe Hunter (silver action with detailed game scene with gold inlays and upgraded wood). The Initial Hunter has a MSRP of $1250, the Grey Hunter is at $1695, and the Deluxe Hunter is at $2100 MSRP. The published specifications are as follows. 6lbs. 5oz. – 6lb.s 13oz. Autoloaders (and firearms in general) seem to get more tragically ugly every year. Much of it is self-inflicted by the consumer, for we like cheap. Cheap means stocks made of melted milk jugs and ground up garbage can lids, with rough, matte, unfinished surfaces, and a minimum of polishing, finishing, and fitting. When was the last time a new autoloader was introduced that made you say, “That's a beautiful gun!” It really has been a very long time, for crate-wood stocks have descended into plastic, bluing has become “water-transfer printing,” and even the physical triggers themselves have too-often become a cent's worth of plastic droppings. Despite retail prices climbing beyond $1700 for autoloading field guns, what often comes in the box gets cheaper and cheaper-looking, and uglier and uglier. There is a reason for that: they are both cheaper to make and uglier. The last repeating hunting shotgun I've tested that looked like the folks that made it actually cared is the Remington 870 Classic. Prior to that, I have to go way back . . . back to a Beretta A390 ST Deluxe twelve gauge that I still enjoy, although it is on the heavy side for chasing pheasants. Even the generally good Winchester SX3 Field (aside from the heavy trigger and lousy factory choke tubes) breaches the $1000 retail mark and has just barely adequate wood and an uninspiring matte black look. Fabarm seems to have finally addressed this, for even the $1250 (full boat retail) “Initial Hunter” trim level of the L4S line is far better-looking than most autoloaders out there. They are just now beginning to trickle out: street price looks to be right at $1100 for the Initial Hunter. Rather than the old tactic of taking cheap wood and just staining it dark, the base model is a cut above. Additionally, it appears that Fabarm does a far better job with the fundamentals of trigger quality and choke tube quality than most everyone else out there, along with what is now recognized as a top-notch customer service and a five-year warranty that actually means something, as opposed to the “no written warranty” SX3, Silver, and Maxus models from Browning, and the peculiar one-year warranty of Beretta backed by an invisible factory customer service department. A Fabarm L4S is in transit, so expect a full review shortly.